Updated at 6:46 p.m. with image of Mayor’s veto letter at the bottom. 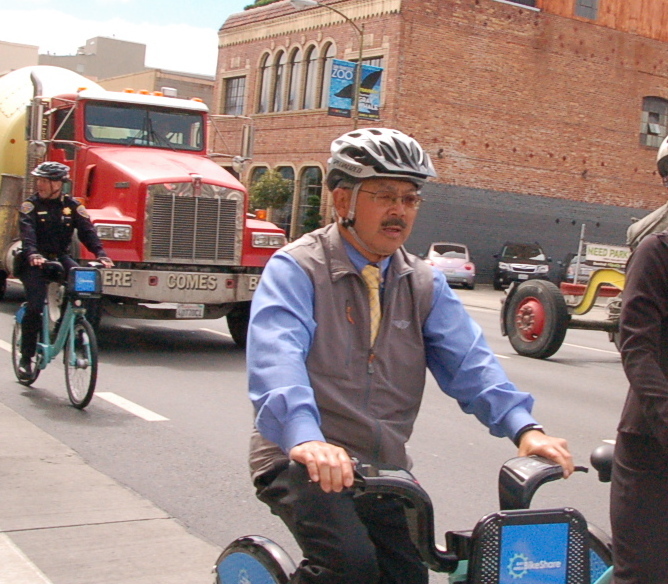 Mayor Ed Lee has vowed to veto the “Bike Yield Law” put forward by six supervisors. Assuming the mayor follows through, it will take a vote from eight of the 11 supervisors to override him. I’m not willing to trade away safety for convenience, and any new law that reaches my desk has to enhance public safety, not create potential conflicts that can harm our residents. So the mayor’s spin is that the majority of supervisors want to “trade away safety for convenience.” How tone-deaf. The Bike Yield Law, of course, is all about safer streets through the efficient allocation of law enforcement resources. By legitimizing the normal practice of bicyclists yielding at stop signs — even the SFPD captain who cracked down on rolling stops does it! — the ordinance would help urge police to focus enforcement on violations that actually hurt people. If the cyclist is blowing through the intersection and not entering slowly and cautiously, they absolutely should get a ticket. But when you look at what is causing injury and death on our streets, it’s not a cyclist entering an intersection at a few miles an hour. 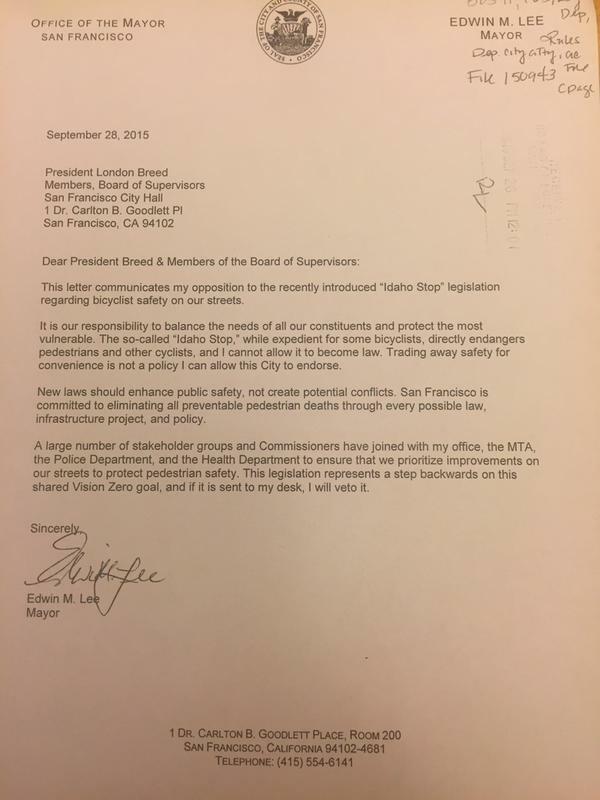 So far, Lee’s legacy on safe streets and sustainable transportation is mainly one of obstruction, and this case is shaping up no differently. But if the experience with Prop B is any guide, Lee might come around to the Bike Yield Law after everyone else has already embraced it. If Mayor Lee really cares about safer streets, he won’t stand in the way of an effort to bring traffic law into the 21st century. I should have to just keep my mouth shut when someone is breaking the law and endangering my life for fear that I may be attacked? That is how you want me to live? Is that how YOU want to live? Also a really good example for my kid. “You know, when we see someone breaking the law we just shouldnt say anything. It might get us in trouble.” It isnt though I yelled at the guy….just calmly said that there was a stop sign there. This is not the way I will live. Definitely not the Colonel. If I was wouldnt I have made about 20 posts to this thread yesterday? I just dont have the time. I do miss him at times though. Actually want to say I really appreciate you here and most places you comment. You seem to have a reasonable approach that the streets and city belong to everyone. No just cars, or bikes or pedestrians but to all residents. Unfortunately what I described above is far too common occurrence in my life. Todays anecdote is the most common one. Large vehicle stops for me to cross. Cyclist coming up behind rides beside car and doesnt see me because of large vehicle, then blows through crosswalk right in front of my face. At least that guy said sorry before I could say anything. Some do, most dont. That is when, in a low calm voice, I point out the stop sign. Tried playing the victim for years but most dont seem to care. Then for the second incident of the day I was waiting for muni and watching pedestrian crossing haight. Guy was coming down haight too fast, slammed on his brakes when the guy in the crosswalk didnt stop for him and cut right in front of him. As a side note I am pretty sure we met years ago on a ride/pub crawl up the peninsula. Only 2 places and then had to get back to the kid. Wife wouldnt give me a full night hall pass.